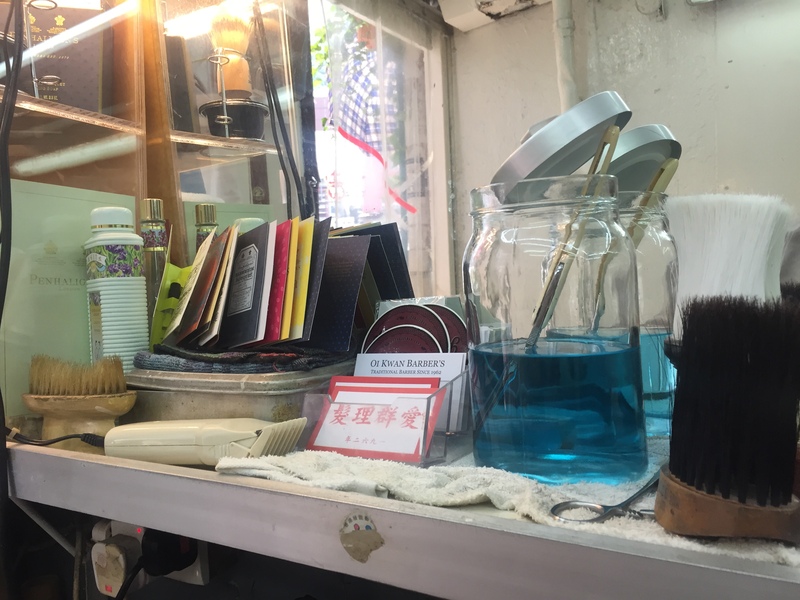 Since 1962 Oi Kwan Barber’s has been running out of a tin shack in an alley between two old Wan Chai tenement buildings. Over five decades the little shop on Spring Garden Lane has taken care of the neighbourhood’s barbering, serving men from all walks of life who reclined, gossiped, debated and joked while the barber, Master Lau, lathered and shaved, clipped and faded under the gentle breeze of a revolving fan. 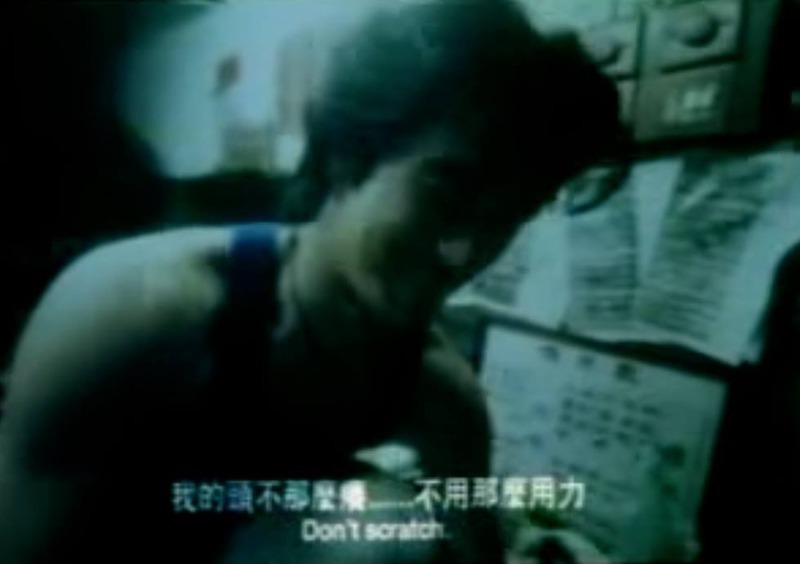 Oi Kwan Barber’s appeared in Wong Kar Wai’s Fallen Angels (1995). It was the beauty of this director’s vision that inspired Mark to take up the mantle of traditional barber. Many of Hong Kong’s craftspeople and artisans view their work as just that – a way to make a living. Not Mark. 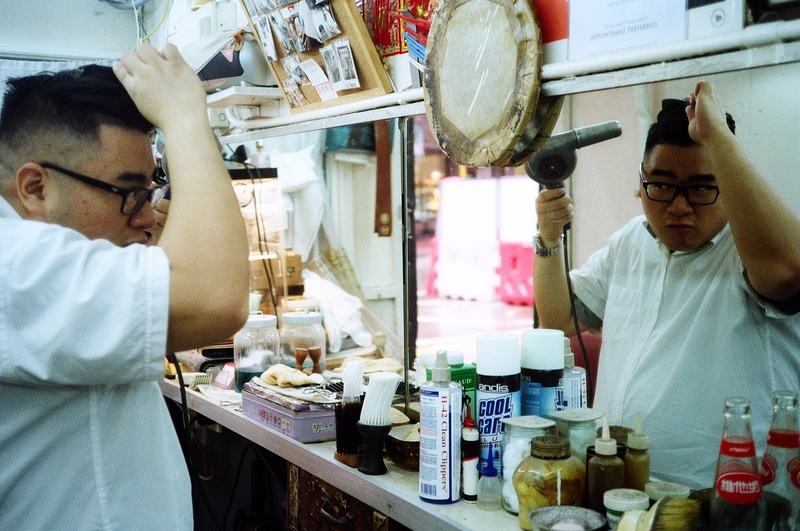 He sees it as his responsibility to carry on and preserve what he calls ‘the Guangdong barbering tradition’. According to Mark, this style which is based on Western barbering, came down from Shanghai some time between the 1940s and 60s then diverged into a distinct branch. Says Mark, ‘The Guangdong Style heavily emphasises getting you what you want’. ‘It will always be one barber who greets, washes hair, cuts, shaves and sends the client off. 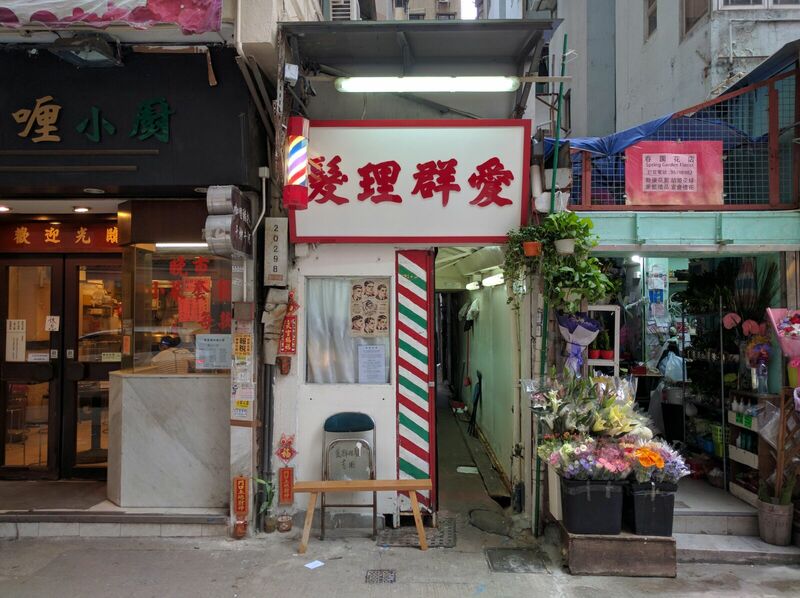 We’re not the same as Shanghainese barbers that have nice shops and cut fast for quick turnaround.’ Aside from a great deal of multitasking and a lean operation, Hong Kong’s traditional barbers place huge emphasis on understanding the customer. Of course, client expectations are also tactfully balanced against professional opinion and expertise. ‘Clearly it’s best to hear about the customer’s preferences and then I’ll tell them a little about my opinion based on experience. For instance, if a Chinese person brings in a photo of a Westerner and says they want that haircut then I might have to say that we’ll adapt it for his head because Western and Asian skull shapes are quite different. It’s my professional responsibility to let them know, but if they insist then I’ll still do it.’ It’s not the fastest way to get your hair cut but the results speak for themselves. Mark spruces himself up in between customers. These days Oi Kwan’s clientele is changing. Starting with his father’s old client base of predominantly Chinese locals who are now, on average, over 80 years old, Mark’s following has widened and includes many young men both foreign and native. To Mark the reason for this is simple, ‘clients try lots of barbers and when they find one that clicks and knows how to work with them they keep coming back and start spreading the word amongst their friends.’ While traditional and ‘vintage’ ways have come back into vogue not all traditional barbers have been able to win back the young crowd. ‘It’s funny’, Mark chuckles, ‘in the last couple years the classic styles have been very popular in the West so as a result they’re now also popular in Hong Kong. Young guys want really tight skin fades which is not necessarily what barbers want to do. This stuff isn’t new at all, it’s old stuff combined with new to meet the needs of today’s young people. Actually this classic hairstyle which we call ‘油頭‘ (‘oil head’) is exactly the same as a haircut which was popular in 1992 except that back then the fade wasn’t so tight. In Guangdong we have a saying , ‘古老當時興’ (the ancient becomes the trend). Very interesting.’ Mark’s knack for traditional modernity has brought him success with the kids but it’s also proven popular with the old guard. ‘Some of my dad’s regulars have been getting the same haircuts for over 50 years but they’re seeing these new classic styles on young men and they’re saying, “hey, let’s give that a try!” even though they’re about 60 or 80. I do it for them and they like it because they look a bit like the haircuts they used to get when they were young – short at the sides with the top combed into a 蛋撻（dan tat/egg tart）style. Mark has worked hard to modernise his classic barbershop, making sure that everything is clean and up to a high standard, just like his haircuts. Two generations of barbering – Mark still displays his late father’s name card in the shop. 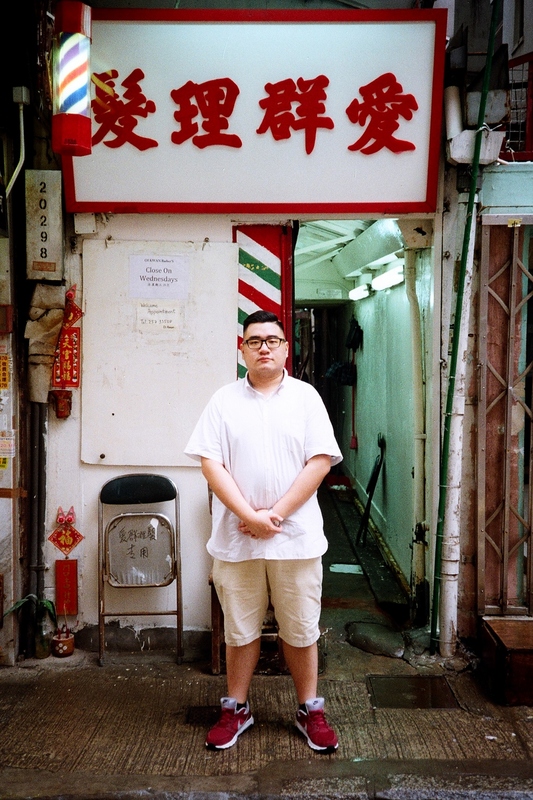 What does the future hold for Oi Kwan and the barbers of Hong Kong? Mark dares not speculate. ‘All I can do is carry on, serve customers and be happy. 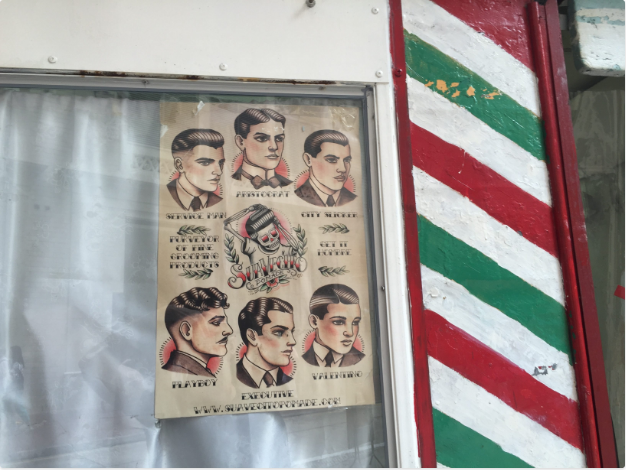 My greatest hope is to continue the tradition.’ To this end Mark persists in improving his skills to bring traditional barbering into the modern age: ‘Lots of people think, this is just an old timey way of doing things, for old guys. They ask if razors are hygienic and if they could catch AIDS from them. Ever since I took over from my Dad I’ve been modernizing the shop, using barbicide and bioclean so that my customers have peace of mind. It’s worth it. Only when the customer has faith will they be happy to be shaved or have their hair cut by you. I love it when I go out and about in Wanchai and customers greet me on the street. They yell ‘Master! How are you?’ It pleases me when they send photos with their haircuts – it makes me happier than making money! It’s a kind of happiness that can’t be described. Cutting hair is a kind of art and it makes me very satisfied. You can’t just churn out haircuts from a mould like some copycat; I don’t like that. Yes, cutting hair is art.’ To the practical youth of Hong Kong, Mark has this to say: ‘I hope that young people will join the profession. This culture is Hong Kong’s and it’s worth preserving. You may never be rich as a barber but I guarantee that you will be happy and able to raise a family.’ By looking at him you know he speaks from experience. 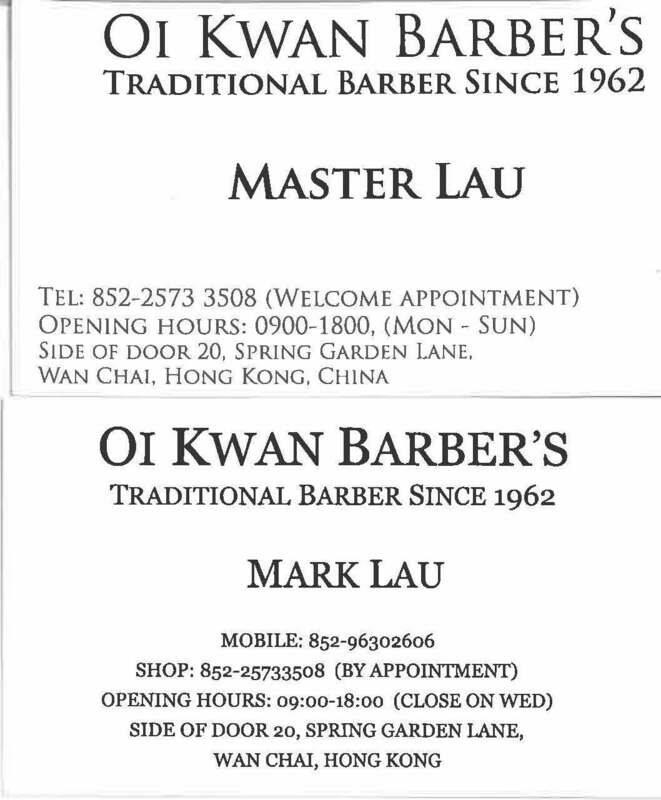 Oi Kwan Barber’s can be found (for now) at the Side door of 20, Spring Garden Lane, Wan Chai. Call (852)2573 3508 for an appointment. Closed Wednesdays.